Surgical management of acute aortic infection is challenging, including excision of the infected segment and reconstruction either through extra-anatomical bypass or in situ graft replacement with higher risk of re-infection. Here in, we present a case of delayed paralysis developed after an extra-anatomic (axillary-bifemoral) bypass of infected thoracic aorta in a 51 year old Caucasian male. Reversal of paralysis was successfully achieved via larger extra-anatomical ascending aorta to infra-renal aorta bypass and cerebrospinal fluid (CSF) drainage. Aortic infection, whether primary or secondary to surgical or stent-graft repair, is a rare and devastating complication often requiring aortic ligation. Incidence of aortic stent-graft infection specifically ranges from 1-4.7% with mortality rates reaching 25-75% -. Here, we present a case of ischemic spinal cord injury (ISCI) and visceral ischemia that complicated extra-anatomic (axillary-femoral) bypass done to restore distal perfusion after excision and ligation of an infected thoracic aorta. 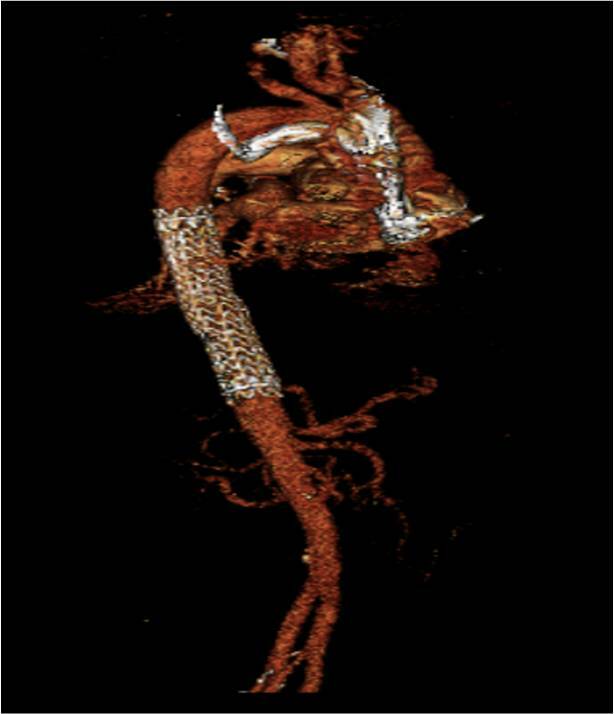 Reversal of paralysis and ischemia was achieved with a combination of a larger, extra-anatomic ascending aorta to infrarenal aorta bypass and CSF drainage. There was a concern about the inadequacy of the axillary/femoral bypass in restoring the flow versus the direct ascending aorta to the infarenal aortic bypass. This case raises an important question: what is the ideal extra anatomic bypass after complete ligation of the thoracic aorta? A 51 year old Caucasian male with coronary artery disease status post stent placement, congestive heart failure with an ejection fraction of 22%, hypertension, diabetes, atrial fibrillation, peptic ulcer disease, and esophageal varices presented with a ruptured, infected mid-descending thoracic aorta. The etiology may have been a pseudoaneurysm (Figure 1a) from recent endoscopic cauterization of an esophageal bleed or primary aortic infection. A Gore TAG device (Figure 1b) 15 cm in length and 28 mm in diameter was emergently placed well below the subclavian artery and extended to 8 cm above the celiac artery to temporize the hemorrhage. As expected, postoperative CT angiography (Figure 1c) showed a peri-aortic and peri-endograft abscess. As an attempt at definitive repair, he then underwent right axillary to right femoral bypass with a 10 mm diameter Dacron graft and left thoracotomy with endograft removal, excision of the infected aorta, and aortic ligation. It was hoped that the 10 mm right axillary to right femoral bypass would provide sufficient retrograde perfusion to the viscera and spinal cord. However, two days after this procedure, the patient developed bilateral lower extremity paralysis, abdominal pain, and anuria with a patent axillary-femoral bypass. Although no objective measures of distal perfusion were done after axillary-femoral bypass such as ABIs or PVRs, we did suspect distal malperfusion with spinal cord, visceral, and renal ischemia. We did note that though the feet were warm and well perfused, he did not have palpable pulses, suggesting some decrease in perfusion given his otherwise normal arteries. An L4/5 lumbar spinal drain was placed 10 hours after the onset of weakness as an adjunct for his paralysis andthe patient urgently went back to the operating room for sternotomy andbypass from the ascending aorta to the infrarenal aorta with a 20 mm Dacron graft, avoiding the left chest. Intra-operatively, the patient began making urine. He also did regain pedal pulses. The next day, the patient was able to wiggle his toes but still had proximal muscle weakness. ISP was maintained at 10 mm Hg. An intravenous naloxone infusion was administered at 0.001 mg/kg/hr for 3 days. Mean arterial pressure was maintained in the high normal range. Over the next several days, the patient regained motor function in his lower extremities, such that by postoperative day #9 the strength in his hip flexion and extension was 3/5, his knee flexion and extension was 4/5, and his ankle flexion and extension was 5/5. He was independent in all bed mobility and was able to transfer. He was able to ambulate with assistance and had good balance. The patient was transferred to a rehabilitation facility. Progression of infection in native aorta and stent-graft. a. Angiogram on hospital day #2 demonstrating pseudoaneurysm of the descending thoracic aorta. b. 3D Angiography s/p placement of Gore TAG device (15 cm × 28 mm) over pseudoaneurysm of descending thoracic aorta. c. Chest CT scan demonstrating a large periaortic abscess around the region of the endograft measuring 8.2 cm × 8.8 cm × 8.2 cm. 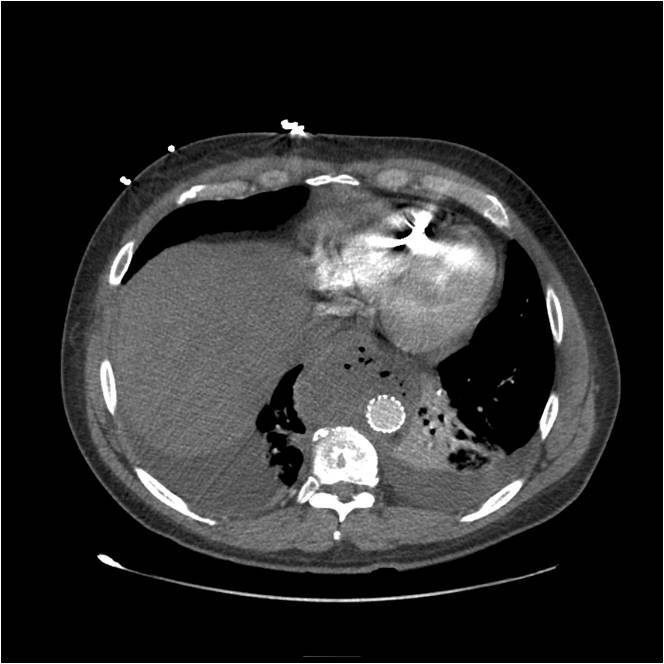 Here, we present a case of delayed paralysis after surgical management of an infected thoracic aorta by axillary-femoral bypass. The axillary-femoral bypass was complicated by inadequate perfusion to the spinal cord and kidneys. This case raises an important point about the ideal extra anatomic bypass after complete ligation of the thoracic aorta? Which then leads to the question; does the axillary-femoral bypass adequately perfuse distal organs versus the ascending aorta infarenal aortic bypass? and what is the flow volume and distal perfusion pressure required to maintain end-organ perfusion distal to an aortic ligation? In this case, unfortunately flow volumes and pressures were not measured through the patent axillary-femoral bypass and there were no objective measures of distal perfusion done after axillary-femoral bypass such as ABIs or PVRs. Clinically, we did note that though the feet were warm and well perfused, he did not have palpable pulses, pointing to impaired distal perfusion given his otherwise normal arteries. Additionally, the patient developed anuria and lower limb paralysis suggesting direct renal and spinal cord malperfusion. The timing of delayed spinal cord ischemic injury could be attributed to the initiation of an apoptotic cascade within the neurons . Before spinal drain catheter insertion, there was concern about putting spinal drain in an infected patient. After weighing risks and benefits, decision was made to insert the catheter. The ultimate reperfusion was achieved by surgical switch of the axillary-femoral bypass to an ascending aorta to infra-renal aorta bypass, which provided adequate perfusion to the kidneys and the spinal cord as evidenced by improved urine output and lower extremity neurologic function. We believe that the ascending aorta to infra-renal aorta bypass provided adequate distal perfusion while the axillary-femoral bypass did not. Other complications of axillary-femoral bypass are graft failure, aortic stump thrombosis, and rupture . To maintain adequate perfusion of the kidneys, gut, spinal cord, and lower extremities distal to the excluded area of the aorta, a threshold volume flow and pressure is required. Effective proximal-to-distal aortic shunts have to carry 60% of baseline blood flow and maintain a mean pressure of 60-70 mmHg in the distal thoracic aorta. In cases of left heart bypass, flow rates of 25-40 ml Kg-1 min?1 produced by centrifugal pump are enough to maintain satisfactory renal and spinal cord perfusion . Intra-operative measurement of blood flow through an extra-anatomic graft may be advised to assure adequate distal aortic perfusion. Also, monitoring of spinal cord function through somatosensory and motor evoked potentials can be performed intraoperatively to predict future neurological dysfunction . Regional cooling is another adjunct that may be considered for spinal cord protection during these cases. Regional cooling is an effective tool for neuroprotection during open repair of thoracoabominal aneurysms that has not been described during endovascular procedures . However, we believe that the ascending aorta -infrarenal bypass was the critical factor in reversing the ischemia. We believe that when planning extra-anatomic bypass in cases where aortic ligation is necessary, measurement of pressures and flow volumes distal to the extra-anatomic bypass may help in the future to predict success or failure of distal perfusion which we have not done in our case. Written informed consent for publication could not be obtained from our deceased patient's next of kin despite all reasonable attempts. Every effort has been made to protect the identity of our patient and ensure anonymity. We greatly acknowledge all surgeons and physicians in Department of Vascular surgery and Cardiac anesthesia, for their helpful discussions on this case. MG performed the surgery, HA conducted the anesthesia for the case, and HE drafted the manuscript. HA, HE, LB, GD, and MG all are contributor in writing the manuscript. All authors read and approved the final manuscript.